YOU: Losing Weight is written by Dr. Michael Roizen and Dr. Mehmet Oz, who are also the bestselling authors of YOU: On a Diet. Their latest book includes a collection of 99 tips and practical strategies to help you get in shape and achieve the body you have always wanted. Many dieters don’t have the time or inclination to read diet books with detailed or complicated programs. So the authors created this book as a “shorthand version with all the tips and insight you need to get going and help you lose weight”. In this book Dr. Roizen and Dr. Oz outline their basic philosophy and explain why crash dieting never works as a long-term strategy for losing weight. The book consists of separate sections addressing different aspects of a weight loss program including Body Basics, Food, Activity and Exercise, Mind, Lifestyle and More. Throughout You Losing Weight, you will find comprehensive information about the science of weight loss, the influence of hormones on metabolism and appetite, education about basic nutrition and practical tips. A fourteen-day diet plan is included which includes three meals and two snacks daily. The meals emphasize fresh fruit and vegetables, whole grains and lean protein. Every other day you are permitted a dessert such as an ounce of dark chocolate. Shopping lists and weight loss super-foods recipes are provided including a recipe for the “BEST breakfast smoothie ever”. Fruit, vegetables, whole wheat bread, whole grain cereal, brown rice, kidney beans, eggs, low fat yogurt, cottage cheese, chicken breast, turkey, lean meat, salmon, Boca burgers, walnuts, peanut butter, dark chocolate, tea. You Losing Weight includes a 20-minute fat-blasting workout that doesn’t require the use of weights. You should do this workout three days a week and on alternate days perform cardio exercises such as jogging, walking or cycling for thirty minutes. Stretching and yoga is also recommended. 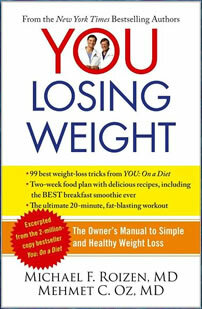 YOU: Losing Weight: The Owner’s Manual to Simple and Healthy Weight Loss retails at $8.99. Click here to purchase the book online. Increases knowledge about the science of weight loss. Includes a two-week meal plan with recipes. Addresses the importance of the mind in an effective weight loss program. You: Losing Weight Includes an exercise plan. Inexpensive compared to many other diet programs. Does not provide any new information for readers of YOU: On a Diet. May take time for weight loss results to become apparent. YOU: Losing Weight is basically a pocket-sized version of the bestselling book YOU: On a Diet, in a simplified format that is easy to follow and understand. This book includes basic education, common sense suggestions and practical strategies that you can incorporate into a healthy lifestyle approach to weight loss.